We believe the best Steadyfast Stabilizer System review is provided by feedback from our customers. All feedback is as provided by customers. No changes have been made to punctuation, spelling or statements. Also the RV Related Stuff That He Likes. Just wanted to let you know I installed your system yesterday, took about 2 1/2 hrs. I am truly impressed with how well made the system is & how much movement it eliminated in my 32' 5th wheel.I also love the fact I do not have to remove, store & reinstall it everytime I set up camp. I will definatley recommend your product. I just took my first camping trip with the new Steady Fast system. I installed the system by myself and without any difficulty. Your instructions were excellent. 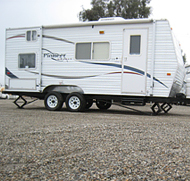 Before I installed the Steady Fast system, my fifth wheel would bounce and sway when my wife and I walked in it. Now with the system installed the fifth wheel did not bounce and did not sway. It is easy to forget you are even in a fifth wheel, the system works so well. Thanks for great American engineering! Just finished installing the Steadyfast on my 30' Outback Trailer. Just wanted to say that the install was easy, as advertised, and that it works EXACTLY as advertised. The side to side shake is gone and I could not be happier. Your product is excellent, shipping was very quick and I am a VERY SATISFIED CUSTOMER. Thank you very much...I am going to recommend you to everyone I know and even this I do not know. Send me some more business cards, and I will get you more business. I install my steady fast on my fifth wheel in June. We have been on three camping trips since and this product is wonderful. It was easy to install and instructions were easy to read. Thanks for making a very useful product and it actually works. We were excited to find your product as we were contemplating methods of solving the inherent movement associated with a 5th wheel, and are equally anxious to complete the installation and be able to eliminate the movement in our 5th wheel. I have been impressed with your Company from the get-go. First, when I placed my on-line order and within 20-30 minutes received a confirmation from the shipping company that the order had been processed by you and was in their possession, ready for transport. The SteadyFast system arrived as stated, IMPRESSIVE, it is solid in it's construction and nicely built, with an eye to longevity of service. Second, your response to questions/concerns has been fantastic and greatly appreciated. It is "old school" business, utilizing modern technology, as it should be done, something that is often lost in this age of non-personal business practices. Thanks for your product and service. Just a follow up on your Steady-fast System. Received it on Saturday afternoon and had it completely installed by Sunday afternoon It works perfectly, just as advertised. The side to side movement in our fifth wheel is now gone and it's solid as a rock. Thank you for creating a product that actually does what it says it will. Just wanted to send you a quick note about the steady fast system that we purchased from you. We have been using it since May and absoultely love it. The trailer has never been been more steady. I just wanted you to know that I would and have highly recommended it to several people. Thank you for your help when I called and needed some help. I wanted to thank you for taking my call a week and a half ago on Sunday when I had a question about installing your Steadyfast system on our fifth wheel. I was pretty sure I knew the answer but wanted to make sure before I started drilling. We are very happy with the results. I also want to compliment you on your thoroughness and illustrations on you instructions. I was especially impressed with the detail on the individual hardware packages for each step of the installation. Installation was straight forward and it took me a couple of hours but I double checked everything as I was doing it. I will be recommending your system to my friends. Just wanted to let you know how extremely happy we are with our purchase of your system!!! You were able to ship it to us right before we left for our vacation. My husband installed it easily and it worked perfectly. We just wanted to say "Thank You" for a product that actually and truly works!!! Thank you!!! Hey Paul I added an extra set of scissor jacks to the rear of my camper (because my unit has the sliding bike rack). All I can say is that your product is amazing. With four scissor jacks on the rear of the camper and I can't make it move (with the brace tightened). My friend thought you were faking in the video when you were trying to move the 5th wheel after you tightened the knob on your braces. I texted him that you wern't faking... Thanks again. Add me to your list of satisfied customers. not at this time using our tripod. Thank you for your fine product. I just finished installing your Steady Fast stabilizers on my 37'cougar 5th wheel and for the first time since I got it I can say it feels solid. This RV was extremely instable I guess this is probably due to the layout of the RV. There are four bunk beds in the front and the main bedroom is in the back add to this the bed is a slide so the head of the bed is extended. Every movement in this RV could be felt and was unbearable when the kids would be playing in their bedroom (bunkhouse). The last time we used our RV we had friends go with us, we let them have our bedroom so they would be more comfortable. The next morning they jokingly compared it to being on a cruise. When I got home from that trip I started looking at stabilizers and decided your system would work best for my RV ,the 6 leg stabilizer system would require me to attach brackets in the center of the RV this would not be possible with the sliding rack on my cougar. The installation went fairly smooth, I had to add two scissor jacks because my RV has a sliding rear rack and it has the polar package so this added a bit of difficulty to the install. My wife and I would have to say that this is the best money we have spent on the RV. Just finish installing your product on my fifthwheel (35 ft toyhauler) and it is simply SUPER . I would recommend your product to anybody. LOVE this product. It does exectly what it says it does. Installation was very easy & the difference from before and after is night & day. Our trailer feel very solid when walking around inside now. Just installed your Steadyfast system on our Keystone Big Sky, and what an improvement!!! It has taken 80 – 90% of the shaking out and we’re delighted. Best of all, we have a system that sets up quickly (since it’s already attached); I only have to tighten the Locking Handles. That’s important since we plan to travel. Our rig has the power front landing gear and rear power twin stabilizers. The installation was seamless and completed by me alone in just a few hours. Congratulations and thanks for inventing this great product. I can't believe how great your Steadyfast system is! I have installed it on a Rockwood 5th wheel and what a difference. The installation took awhile but it was worth it.Looks great too. Thanks so much for a great RV product. I just purchased and installed a STEADY fast system on my brand new Open Range Journeyer 5th Wheel JF287RLS. I am very satisfied with both the quality and functionality of your system. The directions were outstanding, the pictures were a big help and it was relatively easy to install. The results were really amazing, the trailer is steady as a rock when the system is engaged. Good Job, Good Design and great results! Thanks! Tom Arney, a very satisfied customer. Thanks for taking my call this week about the "missing" part on my SteadyFast shipment. I'm sure you've heard this many times before...but I just installed the kit in 2.5 hours in the heat and humidity of a South Carolina afternoon, and it works flawlessly! The instructions were well written and easy to follow and I can't believe how much shake has been removed from my 32' Puma. I've already shown my dealer the camper and he's is very interested in offering this product. Paul...I just wanted to give you a feedback note on how well the Steadyfast did recently out at California City in high winds, with gusts to +50 mph. Over this past Thanksgiving Week (2010) the family and group spent the week out boondocking in the wilds of the desert, and with these winds, we were truely amazed at how steady our 5th wheel stayed even with broadside and quartering winds howling outside. Thank you for coming out with such a great product. I've had other folks out there look at the system, commenting on how "my" RV didnt "rock n' roll" like theirs, even with them using the tripod and blocks between the tires. Think you might get some new customers soon. I want to once again thank you for an outstanding product. I had inadvertenly called you one day my time in Maryland was 9 am it was 6 am your local time in California. What was I thinking? You answered your phone anyhow and asked that I place the order on line so I did that imeadialtly since I wanted this product for my trip which gave me five days total to get it and install it. Paul you took my phone call before you finished your morning routine and shiped it out that morning. It arived the next day the greatest customer service I have ever experieinced. I could not beleive anything could ship that fast ever. I had my Son come down and give me a hand installing your kit on my 2007 Keystone Cougar 295 RLS with two slide outs. The front two braces took 45 minutes to install, by the way the sharpest drill bit I ever used came with this kit. I had to wait two more days to install the rear since I had two additonal jacks comming and located them infront of the rear step and behind the rear wheels by a foot and a half, since this model has jacks under a rear sliding bike rack it was not strong enough to support the braces or even a place to attach them. that took another hour since this has an encolosed belly. So total time to install your kit and two additonal jacks 1 hour and 45 minutes with help of course not bad at all even at the projected three hours it is well worth the time. We tested it right in the driveway no shaking what so ever. Two days later and off on vacation to Virgina Beach. there were five of us in the rig and I did not feel a thing no shaking no bouncing what an amazing product. Two other campers were there and asked what that was so I showed it off and gave them your card and told them simply buy it and install it you will be amazed in the transformation. Paul I will go an extra mile for showing your product to anyone I believe in "paying it forward" and since you gave me such great customer service and an outstanding product I will do endorse your product every chance I can. On another note the V blocks that are recomended for use I did go to the local home depot store spent $22.38 total on three 4x4x8 foot long pressure treated lumber while I was there I asked them to cut them down to 1 foot blocks so I have 24 of these that I did end up using. so finding these and having them cut for free was not too painfull at all. Now I have enough for six legs on the camper and a variety of unlevel situations. Paul, Thank you again and God Speed. just wanted to let you folks know received unit in great time. had no problems with install. great packaging !! works great on our 37.5 5th wheel. thanks for a usa product. Paul I just had my steady fast installed today. The guy I use is Ron at D&Rs Family RV in Glendale, AZ 623-842-1265. He does mostly solar installations but he only took 1.5 hours to install the system today. Maybe you could put him in your data base in case anyone in the Phoenix area orders your product. Monday, I'll pull the trailer to a park in Northern Arizona and use it for three months to get out of the heat here. I know I'll enjoy it with out the shake, rattle and roll. I have both a three and a four year old daughter who sleep in the back of our fifth-wheel. As small as they are, every time they rolled over in their sleep we used to feel the sway in the front of our fifth-wheel. Frustrated by this excessive movement, I looked for a fix. Engineering wise, your product seemed to make the most sense so I ordered it with hopes. I installed it today and was amazed at the results. My opinion of our fifth-wheel changed instantly due to the installation of your product. Normally, I m not the kind of person to offer feedback on a product but I think you have done a good thing in a consumer market that really needed something like this. Kudo s to you and the job you have done. Your $300 product completely changed our opinion of our $26,000 camper. Just got back from a few days at the beach........a trial run for your stabalizer. All we can say is WOW what a product!!!!!!!!!! From the first step up into the trailer (3 steps) and the 2 steps to the bedroom area not a bit of shaking. Needless to say we are so glad that we bought it at the RV show. Thanks for sending the longer tube for the rear stabilizer. It worked just fine. It's lighter than my patch job and looks better. I'll send pictures next week from another computer because my laptop doesn't seem to want to. I'd recommend your system to anyone and feel free to use me as a reference. My husband, Don Winters, installed the Steady fast stabilizers last night and WOW! He opened the slides and I went in and tried to get the camper to shake and couldn't. I love this product!!!! We really appreciate the extra effort you made to send us another set when FedEx lost the original set. I have made several copies of information from your web site and plan to give them to anyone who shows an interest. We head out this Friday for 2 weeks in Colorado to a very large campground so hopefully we can get you more business. I received the stabilizer kit, and started putting it on around 4pm, I followed your directions, and it went together very well. It took me around 3 to 4 hours, and using my base plates worked out well. I believe if I was to install them again it would go much faster. The rv is very stable and I am very pleased with the results. It is a good investment! But I will be able to give it a good test the next few weeks while we are on vacation. I will try to send some pic to you, thank you for going the extra mile and sending the second kit overnight, I hope you get the lost kit back from fedex. I received my system on tuesday afternoon. I had personal things going on plus a little vertigo happening but trudged on. I needed to make a few adjustments because of my situation but did it well and solidly to not take away from your system. I will say your system is good looking & well built with everything in a place & a place for everything. Even with the mods I needed to make it went well in 80s plus high humidity. I haven't yet tried it from a stabilizer standpoint but feel assured it will work very well. I am very pleased with the manufacturing quality and the fit of everything. I did want to share with you that there were some small parts packaging issues. The 6 bolts that were for the slide joint on the tubes said 5/16 -18 but were shipped as 5/16- 24 and the 1/2 in locking nuts for the tee handle locking one was a standard non locking nut. I luckily had these items in my shop but I wanted you to be able to correct this mistake for some one else at least. As I had told you I too had done a lot of experimenting on motion in the unit & I believe you have gone the additional step that may be the answer. I will soon be pulling the rig up on the drive to level & try the stuff out and I am expecting it to do the JOB! I installed your SteadyFast stabilizers on my 2008 Big Horn 30' Fifth Wheel Trailer on July 2nd. The installation took just under 3 hours, and went without a glitch. The next day we travelled from Baltimore to Catawissa, Pennsylvania and camped for for 5 nights. The stabilizers are everything you advertised them to be, and I am very pleased with them. They are certainly a great improvement over the tripod stabilizer I formerly used. Hi Paul I hope everything is going okay. The camping trip was great I passed out several pamphlets about your product. I hope some of them contacts you in the near future. The system worked real well on uneven gravel site. I had several people look at the system some of them asked questions. I will keep you informed of things in the future. Just wanted to let you know what a pleasure it has been dealing with you. When RV is part of the conversation, "cheesy" always comes to mind. Seems like the manufacturers always try to make it look good with the "cheesiest" components, that are paper thin, and don't last. I've only owned my Keystone Cougar 8 months and the term "Price Level Entry Point" means alot more to me now then when I signed on the dotted line. Your product breaks a new trail. I don't think it's over built, but is quality material. Installation was fairly easy, the hardest part was access to the covered underbelly to be sure no wires or pipes were running where the drilling would take place. Self threading bolts were the nuts!!! As a past president of our local Rotary Club, I also wish you good fortune for the proceeds you will ear mark for you Kiwanis Fund raisers. 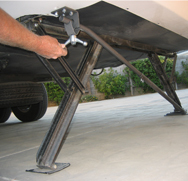 I ordered the Stablizing System from you and I installed it on the trailer mentioned below. From the time I ordered it, which was on a Wednesday, you had it sitting on my doorstep the following Monday, and thats even in a different Country. I Installed it today and it took me under 2 hours to do this. I set the trailer up and walked around in the trailer and I couldn.t believe how much the the movement was taken out by this system. Like you say it makes it rock solid. I would recomend this system to anybody that asks about it. Actually this system should be factory installed on all trailers pull or fifth wheel right from the factory. We just pulled in from Carson City with the trailer. The hitch worked great! We had plenty of trucks passing and had some very gusty winds between Reno and Truckee on the way back. I would recommend the hitch to anyone who wants a nice stable tow trailer. The SteadyFast worked great. We even slept through a small earthquake on Friday night. Now that we have used the stabilizers, I can't picture not using them. Our sincere thanks for all of your help and assistance with both the hitch and the stabilizers. This is Mark Waller in Southern California, Temecula. Just wanted to let you know I got the stabilizer installed on my Challenger trailer today and oh what a difference. It was actually a pretty easy install. So thank you very much for a great product ,talk to you soon, good bye. Ebay feedback from Mark: What a great product! Instructions were as good as the product!!!!!!!!!! This is just a brief word to follow up on our purchase and your installation of our Steadyfast stabilizing system. 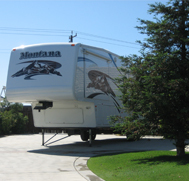 We have used our 38' Teton fifth wheel trailer several times since I saw you last, and have had sufficient opportunities to test out our Steadyfast stabilizers, both as to ease of use when hitching and unhitching, and especially as to living in the trailer with the stabilizers in operation. I am very pleased not only with the ease of use (which could hardly be simpler than it is), but especially with the degree of stabilization achieved. I seem to be more sensitive to "trailer movement" than most RVers; I really don't like it at all. That is why, prior to your installation of our new Steadyfast stabilizers, I had employed: (1) a "crossbar"
stabilizer between our landing gear legs (which itself was a replacement and improvement for our previous kingpin tripod stabilizer); (2) two scissor jacks stabilizers located mid-coach; and finally, (3) a custom "tensioner" stabilizer pressed against the rear skid cylinder. With all these stabilizers in operation, together with our trailer's own built-in rear stabilizers, we were able to achieve very good stabilization. The problem was, however, that considerable time (at least 30 minutes) and effort was involved in getting all those stabilizers in place and operational. I had to be on my knees continually (and briefly even on my back) in order to make everything work. Besides this, I had to allow a fair amount of storage space for the front and rear stabilizers, when stowed away for travel. (unpleasant) labor required to set up my old stabilizers has been completely eliminated. Further, it seems to me that the degree of stabilization achieved with our Steadyfast stabilizers is fully equal to that of our old cumbersome and labor-intensive (albeit effective) stabilizing devices. To me, the cost of the Steadyfast system installed is well worth it--and then some. It is just great to be able to get rid of all of our old stabilizers (while gaining back the storage space they required), while achieving the same degree of stabilization as before, yet with practically no time and effort involved. I would just like to say as well that the quality of your installation work was outstanding, and that it was a pleasure meeting you. The system installed easily and works great. Just installed our Steadyfast on our 38' Pilgram Open Road, and wanted to let you know what you already know. It is solid, even when someone walks up the steps! Install went without a hitch. Thanks for a great product. Its amazing how tight the trailer is. Simple to install with common tools. It is totally different. I have his unit on my Montana and on a small 20' pull trailer. There is virtually no movement with this stabilizer deployed. It has done such a good job that I have sold my tri-pod because I don't need it any more. It took several hours with a good drill and some patience, but it is a DIY project. Mariana ran off to Bodega Bay by herself, and reports the trailer is now rock solid. Thank you for your help and innovation. The system works great. Thanx again for a great product and easy installation. We mounted the SteadyFast stabilizers and have no sway side to side or front to back. You can push against the side at the front by the drop down front jacks and get no movement at all. Same in the back.